A relatively new organization, Common Defense, founded in 2016 by several dozen veterans of the post-9/11 wars, is challenging the field of 2020 Democratic presidential hopefuls to sign a pledge promising to put an end to what George W. Bush called the “Global War on Terror” and to insist that Congress assert its responsibility to authorize any and all U.S. military actions overseas. Called the End the Forever War Pledge, it’s a one-paragraph declaration that so far has been signed by two 2020 candidates, Senators Bernie Sanders and Elizabeth Warren, and by a handful of progressives in the U.S. House of Representatives. This week, The Dreyfuss Report interviewed Alex McCoy, the spokesman and political director for Common Defense, about the organization’s strategy and its current focus on 2020. McCoy, the son of U.S. Navy veteran, himself served from 2008 to 2014 in the Marine Corps, stationed in the Saudi Arabia, Honduras and Germany. 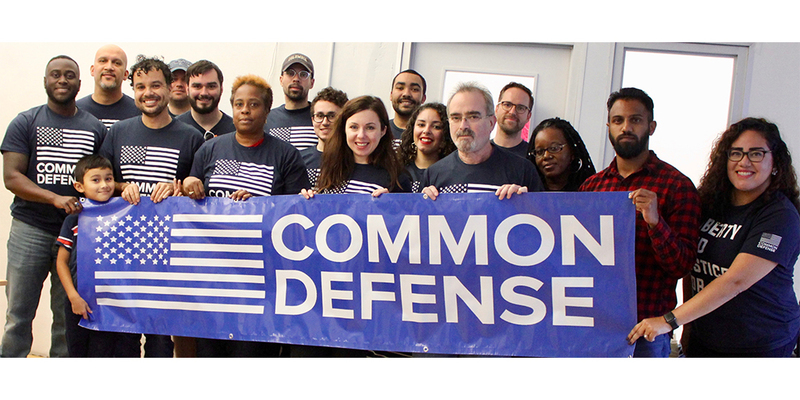 When he left the Marines, he got involved with other, progressive-minded veterans and, in 2016, was one of several dozen who founded Common Defense. Since then, the organization has won the support of 150,000 people across the country, including tens of thousands of veterans and their families, according to its website. One of its goals: to use the pledge as a litmus test to distinguish among Democrats running in 2020. Too often, McCoy says, Democrats try to signal their opposition to President Trump by seeming to be more hawkish than the president himself. What follows is a slightly edited version of the interview with McCoy. Q. Tell me about Common Defense. McCoy: Common Defense arose during the 2016 campaign, when veterans came together to protest Donald Trump, and we realized that there was really no organization that was connecting and convening and mobilizing the progressive veterans community. And in fact our entire community was almost entirely erased, and veterans were conceded as a right-wing group, and Trump flagrantly used us a political props. We wanted to present an alternative view of patriotism, based on equality and justice for all and striving for what we believed American ideals ought to be, rather than nationalism and jingoism and justifying endless war. I’m one of the co-founders, one of a small group of 30 or 40 who found each other, mostly younger vets, of the post 9/11 era. We’ve felt frustrated with how Donald Trump has pretty successfully fooled a lot of people into thinking that he is going to end these wars, and that he supports ending these wars. And the reality is that that’s a lie, like so much else. He’s a fraud. He’s realized that the American public and the American military community is tired of these wars, and he’s trying to tap into that for his own political gain, while simultaneously appointing warmongers like [National Security Adviser John] Bolton and [Secretary of State Mike] Pompeo and riling up tensions with Korea and Iran and Venezuela. But equally frustrating for us was seeing some Democrats reflexively responding to Donald Trump by becoming more hawkish, thinking that, well, anything that Donald Trump says, we have to say the opposite. In fact, that made them get further and further away from what regular people want. So the idea behind this pledge was, you know, we want to re-ground the Democratic party in what regular people want, which is where the Democratic party has been and must be again. So we have to give them the backbone to stand up against the military-industrial complex, the Pentagon, and spending billions of dollars of taxpayer money. And give them the backbone to stand up against the generals who, for reasons primarily to do with their ego, have come up with plan after plan for prolonging these wars, even though they have to metric for success, because they don’t want to be the one who loses it on their watch. Q. Are you worried that you’ll be criticized for dividing the party, by people who say that the No. 1 issue in 2020 is simply defeating Trump? McCoy: We are not afraid of getting involved in primaries. … There is a desire among many candidates to be an etch-a-sketch candidate and not be pinned down. But we believe that electorally and morally, that’s a mistake. In the age of Trump, what people crave is authenticity. We don’t want people who float with the wind. Q. It’s often said that voters don’t really care about foreign policy, and so politicians feel safe when they ignore or speak in vague terms about it. McCoy: One of the things we discovered as we met with politicians in D.C. is that many candidates are surprised that anyone cares about foreign policy. They have this perception that this is something that nobody gives two cents about. Okay, there aren’t many antiwar marches in the streets, but there are zero pro-war marches. The power of the military-industrial complex is not to be trifled with, but it is also soft and vulnerable, and an organized movement can beat it. Too often discussions of foreign policy and the military get sunk into this granular, hyper-specific, wonky, death-by-a-thousand details discussion. Like, this war doesn’t have the right paperwork! And the generals say, ‘Bombing this village is different than bombing that village.’ And the wars are multiplying. We need to make a morally driven case for what America should stand for, and we need to put it in terms that regular people understand. They do care about this issue. People care about imperialism abroad, especially when you connect it to racism here at home. Q. Sanders and Warren have already signed your pledge. Have you read what they’ve said in recent foreign policy speeches and articles? What do you think about what they’ve put forward? McCoy: We’re very excited by the foreign policy visions put forward by Senator Warren and Senator Sanders. There are a lot of elements there that have been missing in the past, like a discussion of the global inequality and the power of a corrupt corporate elite underlying the world’s foreign policy system. We think we have a key opportunity now. A lot of candidates have not put out foreign policy visions. It’s a sign of a lack of discussion within the Democratic party on this issue that so many candidates lack a coherent expression of their view of what America’s role in the world should be. That’s why we think the pledge is such an important first step, for grounding what has been a space we have largely ceded to people who don’t care about us. We believe in challenging the basic premise that foreign policy ought to be exclusively the domain of experts. Foreign policy should be grounded in the needs of and the impact on the people it affects. Will the 2020 Democrats Oppose Trump’s Threat of War with Iran? The bellicose, “America First” nationalism of President Trump might spark conflicts all over the world, but the hottest of hot spots is Iran. That’s where any one of three or four flashpoints (including Israel’s airstrikes against Iranian forces in Syria, U.S.-Iran naval clashes in the Persian Gulf, potential cross-border strikes from Iraq into Iran, and more — could trigger a much wider war. One of the big foreign policy questions facing the Democrats’ 2020 field is: Will you speak out against Trump on Iran? Nearly all Democrats support returning to the U.S.-Iran accord, also known as the Joint Comprehensive Plan of Action (JCPOA) that was signed by President Obama, which Trump abandoned. But far too many Democrats buy into the notion that Iran poses a dire threat to American interests in the Middle East. In a widely circulated piece on Tom Englehardt’s TomDispatch, published today, I provide an analysis of the possibility of war with Iran. For Democrats running for president in 2020, a key issue that they’ll have to face is whether or not they believe in “American exceptionalism,” or to put it another way, whether or not they believe that the United States is “the indispensable nation.” These are fraught terms. Bound up in them is a host of questions about whether, when, and how the United States ought to intervene, especially militarily, overseas; whether the United States is the world’s dominant power or whether that power is shrinking or mostly gone. And for those Democrats, here with answers are Jake Sullivan and Ben Rhodes and their organization, National Security Action, founded in 2018. The 2020 candidates and would-be candidates — many of whom have no foreign policy chops whatsoever, or very little — should approach Rhodes, Sullivan and NSA (those initials!) with great caution. How do we know that Rhodes and Sullivan are offering their help to 2020 hopefuls? Well, they say so. According to a Washington Post profile of NSA last year, according to Rhodes the organization has lined up fully five hundred people, including many former foreign policy, intelligence and military officials, ready to “provide Democratic candidates, lawmakers and policy organizations with a foreign policy tool kit — everything from talking points to legal and policy expertise to campaign surrogates — as they oppose President Trump.” More than sixty of them are listed on their web site, including numerous veterans of President Obama’s administration, including top officials such as Tom Donilon, Dennis McDonough, Susan Rice, Samantha Power, and Anne Marie Slaughter. So what’s wrong with a ready-made team of foreign policy wonks ready to give you advice and, perhaps, join your 2020 campaign staff? Well, suppose that you, as the Democratic nominee for president in 2020, succeed in ousting Donald Trump and putting an end to his confused, belligerent, “predatory unilateralist” (Sullivan’s term, and a good one) style of managing world affairs. In that case, the NSA team might be right for you, assuming that what you’re looking forward to is a return to business-as-usual as foreign policy was conducted from 1993 to 2001 and from 2009-2017. But if you’re looking for something new — and something progressive — you might want to look elsewhere. And, of course, that’s the problem. The NSA is something like a foreign policy cartel, an oligopoly of the priesthood that usually steers the ship under Democratic presidents, and for aspiring U.S. presidents it’s not easy to find a team of advisers — and future members of the Cabinet — in the mold of Matt Duss, the Bernie Sanders’ aide who handles the senator’s foreign policy. If you can’t quite place Jake Sullivan, he’s was a long-serving aide to Hillary Clinton, starting with her 2008 race against Barack Obama, then serving as her deputy chief of staff and director of the State Department’s Office of Policy Planning when Clinton was Obama’s secretary of state. (Senator Amy Klobuchar, if you’re listening, you might already be thinking about hiring Sullivan in the unlikely event that you win the 2020 jackpot, since it was you who introduced Sullivan to Clinton way back when.) In 2016, during her failed presidential campaign, Sullivan once again teamed up with Clinton, and he was widely expected to have been named to serve as her national security adviser or even secretary of state had she won. But when he does get specific, in the case of how the United States ought to deal with a rising China, he suggests “increasing naval operations” in the South China Sea and “forcing Beijing to decide whether to stop us.” That’s a risky proposition at best, even if the United States was capable of challenging China militarily in its own front yard, and it would no doubt require a massive set of defense expenditures to build up the U.S. Navy, Air Force, and the Marines for decades to come. That is, if it doesn’t lead to war. Sullivan has also taken pot shots at two scholars who, over the past two decades, have emerged as non ideological spokesmen for the realist-minded, anti-interventionist worldview: Stephen Walt and John Mearsheimer. In the January-February issue of Foreign Affairs, Sullivan reviews two recent books by Walt and Mearsheimer, The Hell of Good Intentions: America’s Foreign Policy Elite (Walt) and The Great Delusion: Liberal Dreams and International Realities (Mearsheimer). Both of them take a good whipping from Sullivan for their failure, in his opinion, to understand the difficult, often agonizing choices that the foreign policy elite, and policymakers in office, have to make when deciding what to do abroad. Walt and Mearsheimer, he says, “suffer from a failure to distinguish between clear mistakes — such as the war in Iraq — and flawed outcomes flowing from imperfect options.” (Let’s ignore the use of the term “mistake” as applied to Iraq, an illegal, criminal unilateral action that left hundreds of thousands dead and an entire region destabilized.) Foreign policy “practitioners struggle with the decisions they face,” he writes. But Sullivan has no use, for instance, for Walt’s and Mearsheimer’s well-thought-out opposition to “humanitarian intervention,” a favorite phrase in the lexicon of Samantha Power, Anne Marie Slaughter et al. I’m not sure whether to blame Sullivan for Hillary Clinton’s relative hawkishness along the spectrum of Democratic leaders, or whether it was her innate, perhaps politically driven hawkishness that schooled Sullivan and which made him what he is today. Or, perhaps, it was a little of both. For a Democrat seeking the presidency, it’s not easy to find people with credibility and experience to serve as foreign policy advisers who aren’t tainted for being members of what Ben Rhodes famously called “the Blob,” that amorphous confection of wise men and women who purport to be America’s experts. (It’s ironic, of course, that the Sullivan-Rhodes NSA is now, itself, part of the Blob.) But Sanders found Matt Duss, and there are others out there. That’ll be the subject of a future piece: watch this space! What Is A ‘Progressive Foreign Policy,’ Anyway? What is The Dreyfuss Report all about? For progressives — especially left-leaning Democrats and ‘democratic socialists’ — it’s not hard to imagine what the elements of a progressive foreign policy would look like. The purpose of The Dreyfuss Report is to develop, on an ongoing basis, some ideas about reinventing American foreign policy, and to use that as a yardstick of sorts against which to measure the views of the Democratic candidates for president in 2020. In other words, here and elsewhere (including a number of magazines and other publications that I write for) I’m planning to keep track of what the growing contingent of 2020 would-be Democratic presidential hopefuls say and do when it comes to national security, defense, and global affairs. I’ll look at what they’ve already done: their track records, if they have one; their financial backers, from the military-industrial complex to lobbyists and other interested parties that represent foreign countries; what they’ve already said on critical issues, from the Global War on Terror (GWOT), Iraq, and Afghanistan to North Korea, China, Russia, and Israel-Palestine. And, as they assemble their own campaign foreign policy teams, I’ll look at those, too. So what elements would add up to a ‘progressive, 21st Century foreign policy’? In no particular order, I’d suggest: significant downsizing of the $700 billion-plus Defense Department budget, shrinking America’s overseas presence, withdrawing U.S. forces from Syria, Iraq, and Afghanistan, and prioritizing diplomacy over force. The United States should adopt strict conditions in regard to so-called ‘humanitarian intervention,’ in coordination with the United Nations, and revisit the seemingly all-too-easy application of economic sanctions as a substitute for military action. A new foreign policy would elevate an intense effort, in concert with the rest of the world, to deal with the urgent threat of climate change. It would focus attention on the rise of right-wing, authoritarian and ultra-nationalist leaders and political parties, from Europe to Asia. It would avoid confrontation with Russia, especially in Ukraine and Georgia, and with China, especially in South China Sea and over Taiwan. And, working through the United Nations and other international organizations, the United States should lead a worldwide effort to ameliorate poverty, hunger, disease, and inequality, especially in developing countries. Over the last few months, both Bernie Sanders (in an October 9, 2018 speech to the School of Advanced International Affairs at Johns Hopkins) and Elizabeth Warren (in an essay in the January/February 2019 issue of Foreign Affairs) have laid down important markers for the rest of the Democratic field, and both of them made important breaks with what’s passed as Foreign Policy 101 among mainstream Democrats. It’s no secret that in 2016, Sanders was criticized for being weak on foreign policy, and that he’s had little or no experience in global affairs. So, too, Warren isn’t exactly known for her expertise in foreign policy. But both of them have made important strides in the area lately. Except for Joe Biden, who’s yet to decide whether or not he’ll run in 2020, very few of the declared candidates (including the senators, Kamala Harris, Corey Booker, Amy Klobuchar, and potentially Sherrod Brown) are known for their knowledge of world affairs. (And, of course, Bill Clinton, George W. Bush, Barack Obama, and Donald Trump all had virtually zero experience in foreign policy when they decided to run for president. For most voters, of course, foreign policy comes in low when they’re asked about their priorities. (That wasn’t true, in 2006, when the glaring failure of the Iraq war was one of the major election issues leading to the Democrats’ sweeping victory in congressional elections that year.) Still, here at The Dreyfuss Report, I plan to be a watchdog of sorts in regard to foreign policy during the 2020 campaign. Please stay tuned.